I am a very fond of animated movies , they not only relax me but transport me to a different world of dreams and inspire me to keep thinking about endless possibilities that life holds. 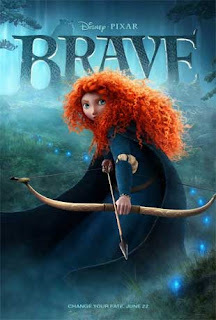 Yesterday I watched the movie 'Brave'. I am kind of in love with Meridas red, curly hair and her independent attitude! Do watch it if you get a chance! "Our fate lives within us…you just have to be BRAVE enough to see it." Thats so veryy true! A simple yet pretty card I made last week, didn't get a chance to post it then! I love the soft pinks I used in this one..